People are by far the most important resource any organization has. For companies who operate in regions with high ambient temperatures, the well-being of their mobile workers who are exposed to these harsh environments is paramount. 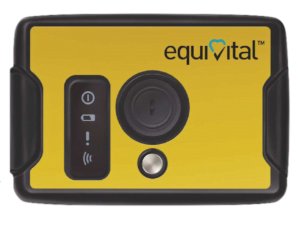 The Equivital Health Monitoring System is designed to monitor and assist with the protection of your team and provides real-time heat stress, safety and performance monitoring so you can be assured everyone is safe and working within their limits. The system comprises of two main components, the EQ02+ LifeMonitor intrinsically safe sensor pack and the Black Ghost real-time monitoring interface. The LifeMonitor senses, records and intelligently processes data measured from the person and is able to transmit this over a wireless or wired interface. The EQ02+ has two components; the Sensor Electronics Module (SEM) and the Sensor Belt. The sensor belt positions the SEM on the left side of the chest. The Sensor belt is available in a range of sizes. It can be worn 24hrs/day and is machine washable. The data which is gathered from the EQ02+ sensors is displayed on the Blackghost user interface platform. 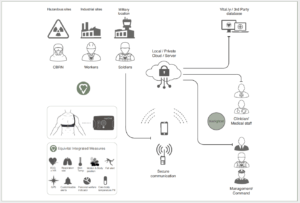 It is this platform which shows real-time status of all personnel wearing the sensor. With the complex algorithms developed into the software, critical events such as heat stress can be predicted and personnel can be pulled off the work-site for critical rest and recovery before anything serious occurs.